The jaguarundi (Herpailurus yagouaroundi) (/ˌʒæɡwəˈrʌndi/ ZHAG-wə-RUN-dee) or eyra is a small wild cat native to southern North America and South America. It has been listed as Least Concern on the IUCN Red List since 2002. 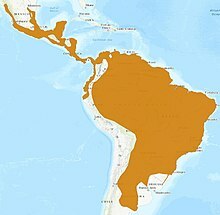 The megareserves of the Amazon Basin are probably the only conservation units that can sustain long-term viable populations. In some Spanish-speaking countries, the jaguarundi is also called gato colorado, gato moro, león brenero, tigrillo, and leoncillo. The Brazilian Portuguese pronunciation of its common English and Portuguese name is [ʒɐɡwɐɾũˈdʒi]. It is also called gato-mourisco, eirá, gato-preto, and maracajá-preto in Portuguese. Jaguarundi comes from Old Tupi yawaum'di. 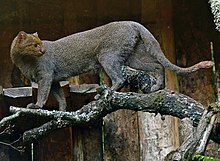 The jaguarundi has short legs, an elongated body, and a long tail. The ears are short and rounded. The coat is without spots, uniform in color, with, at most, a few faint markings on the face and underside. The coat can be either blackish to brownish-grey (grey morph) or foxy red to chestnut (red morph); individuals of both morphs can be born in the same litter. It has a length of 53 to 77 centimetres (21 to 30 inches) with a 31-to-60 cm-long tail (12-to-24 in), and weighs 3.5 to 9.1 kilograms (7.7 to 20.1 lb). The two color morphs were once thought to represent two distinct species: the grey one was called the jaguarundi and the red one was called the eyra. 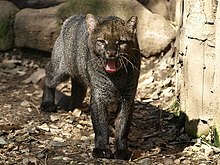 The jaguarundi occurs from southern Texas and coastal Mexico in the north, through Central and South America east of the Andes, and as far south as northern Argentina. In 2015, it has also been recorded in Cerro Largo, Uruguay. Its habitat is lowland brush areas close to a source of running water, including dry thorn forest to wet grassland. While commonly inhabiting lowlands, it has been reported at elevations as high as 3,200 m (10,500 ft). Occasionally it also occurs in dense tropical areas. Jaguarundis have been sighted in Florida since the early 20th century. Here, the species is assumed to have been introduced, but it is not known when the introduction occurred. Their presence in Florida is attributed to a writer from Chiefland who at some point imported the animals from their native habitat and released them near his hometown and in other locations across the state. No live or dead specimens are known, but many sightings considered credible by biologists have been reported. The earliest of these occurred in 1907, and was followed by various additional sightings throughout the Florida Peninsula from the 1930s through the 1950s. The first official report was released in 1942. Significantly fewer reliable sightings were reported after that, and in 1977 W. T. Neill concluded the population had declined. However, sightings have continued. Jaguarundis have also been reported in the coastal area of Alabama since the 1980s, which may be evidence of the Florida population migrating northward. The jaguarundi has also been sighted around the Guiana Space Centre in French Guiana. As of 2017, the Cat Classification Taskforce of the Cat Specialist Group considers the jaguarundi as member of the genus Herpailurus and does not recognise any subspecies. Jaguarundis are primarily diurnal, being active during the day rather than evenings or night. They are comfortable in trees, but prefer to hunt on the ground. They will eat almost any small animal they can catch, typically catching a mixture of rodents, small reptiles, and ground-feeding birds. They have also been observed to kill larger prey, such as rabbits, and opossums; relatively unusual prey include fish and even marmosets. Like many other cats, they also include a small amount of vegetation and arthropods in their diets. Although they seem to be somewhat more gregarious than many other cats, willing to tolerate the close presence of other members of their species, in the wild, they are generally encountered alone, suggesting a solitary lifestyle. Their home range is widely variable, depending on the local environment; individuals have been reported as ranging over territories from 6.8 to 100 km2 (2.6 to 38.6 sq mi). Like other cats, they scent mark their territory by scratching the ground or nearby branches, head-rubbing, urination, and leaving their faeces uncovered. They are shy and reclusive, and evidently very cautious of traps. Jaguarundis make an unusually wide range of vocalisations, including purrs, whistles, yaps, chattering sounds, and even a bird-like chirp. The timing of the breeding season among jaguarundis is unclear; they breed all year round. Oestrus lasts three to five days, marked by the female regularly rolling onto her back and spraying urine. After a gestation period of 70 to 75 days, the female gives birth to a litter of one to four kittens in a den constructed in a dense thicket, hollow tree, or similar cover. The kittens are born with spots on their undersides, which disappear as they age. The young are capable of taking solid food at around six weeks, although they begin to play with their mother's food as early as three weeks. Jaguarundis become sexually mature at about two years of age, and have lived for up to 10 years in captivity. Jaguarundis are not particularly sought after for their fur, but are suffering decline due to loss of habitat. The Texas Parks and Wildlife Department has expressed concern that the presence of the jaguarundi in South Texas may be imperiled due to loss of the cat's native habitat. The North and Central American populations of P. jagouaroundi are listed in CITES Appendix I. All the other populations are listed in CITES Appendix II. P. y. cacomitli, P. y. fossata, P. y. panamensis, and P. y. tolteca are listed as endangered under the Endangered Species Act. The jaguarundi is closely related to the much larger and heavier cougar, having a similar genetic structure and chromosome count. While both species have been traditionally placed in the genus Puma, the jaguarundi is now sometimes classified under the genus Herpailurus, and until recently both cats were classified under the genus Felis. According to a 2006 genomic study of Felidae, an ancestor of today's Leopardus, Lynx, Puma, Prionailurus, and Felis lineages migrated across the Bering land bridge into the Americas about 8.0 to 8.5 million years ago. The lineages subsequently diverged in that order. Studies have indicated the cougar and jaguarundi are next most closely related to the modern cheetah of Africa and western Asia, but the relationship is unresolved. Ancestors of the cheetah have been suggested to have diverged from the Puma lineage in the Americas and migrated back to Asia and Africa, while other research suggests the cheetah diverged in the Old World itself. The outline of small feline migration to the Americas is thus unclear (see also American cheetah). ^ a b c d e Caso, A.; de Oliveira, T.; Carvajal, S.V. (2015). "Herpailurus yagouaroundi". The IUCN Red List of Threatened Species. IUCN. 2015: e.T9948A50653167. doi:10.2305/IUCN.UK.2015-2.RLTS.T9948A50653167.en. Retrieved 29 October 2018. ^ a b c d e f g Sunquist, M.; Sunquist, F. (2002). Wild Cats of the World. Chicago: University of Chicago Press. pp. 113–119. ISBN 978-0-226-77999-7. ^ a b Brown, D. E.; Gonzalez, C. A. (1999). "Jaguarundi (Felis yagouaroundi tolteca)" (PDF). Journal of the Arizona-Nevada Academy of Science (32): 155–157. ^ a b Simberloff, D.; Schmitz, D. C.; Brown, T. C. (1997). Strangers in Paradise: Impact and Management of Nonindigenous Species in Florida. Washington, D.C.: Island Press. ISBN 978-1-55963-430-4. Retrieved August 11, 2010. ^ "Puma yagouaroundi". Integrated Taxonomic Information System. Retrieved May 17, 2010. ^ Endangered Species. Tpwd.state.tx.us (2003-04-15). Retrieved on 2011-09-15. ^ Wozencraft, W.C. (2005). "Order Carnivora". In Wilson, D.E. ; Reeder, D.M (eds.). Mammal Species of the World: A Taxonomic and Geographic Reference (3rd ed.). Johns Hopkins University Press. p. 545. ISBN 978-0-8018-8221-0. OCLC 62265494. ^ a b c Johnson, W.E. ; Eizirik, E.; Pecon-Slattery, J.; Murphy, W.J. ; Antunes, A.; Teeling, E.; O'Brien, S.J. (6 January 2006). "The Late Miocene radiation of modern Felidae: A genetic assessment". Science. 311 (5757): 73–77. doi:10.1126/science.1122277. PMID 16400146. ^ a b Culver, M.; Johnson, W. E.; Pecon-Slattery, J.; O'Brien, S. J. (2000). "Genomic Ancestry of the American Puma" (PDF). Journal of Heredity. 91 (3): 186–97. doi:10.1093/jhered/91.3.186. PMID 10833043. Archived from the original (PDF) on 2007-06-16. ^ Barnett, R.; I. Barnes; M. J. Phillips; L. D. Martin; C. R. Harington; J. A. Leonard; A. Cooper (2005). "Evolution of the extinct Sabretooths and the American cheetah-like cat". Current Biology. 15 (15): R589–R590. doi:10.1016/j.cub.2005.07.052. PMID 16085477. "Jaguarondi" . Encyclopedia Americana. 1920. This page was last edited on 2 April 2019, at 15:09 (UTC).